The Sofie giraffe teether is a favorite teether of my first child and has quickly become a favorite gift to give new parents. In this 3 pack, each one is individually wrapped…perfect for gift giving. The Natural Soother from Vulli is an excellent choice for soothing baby’s gums. 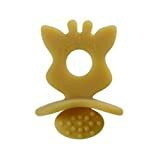 Made of supple, natural rubber, it has unique textures to massage gums. Easily grasped, its curves are designed to fit baby’s little mouth. 100% natural rubber.